Is Freemium Better Than Paid? appFigures collects hourly ranks from the App Store, so we have access to every app’s rank and its price. This has lead us to ask, what will make you more revenue: selling a free app with paid in-app purchases or a paid app? In the month of May in the U.S. App Store, 69% of the 400 top grossing apps were paid apps. The other 31% were free apps. Among the 100 top grossing apps, you’ll see that free apps start catching up to paid apps. 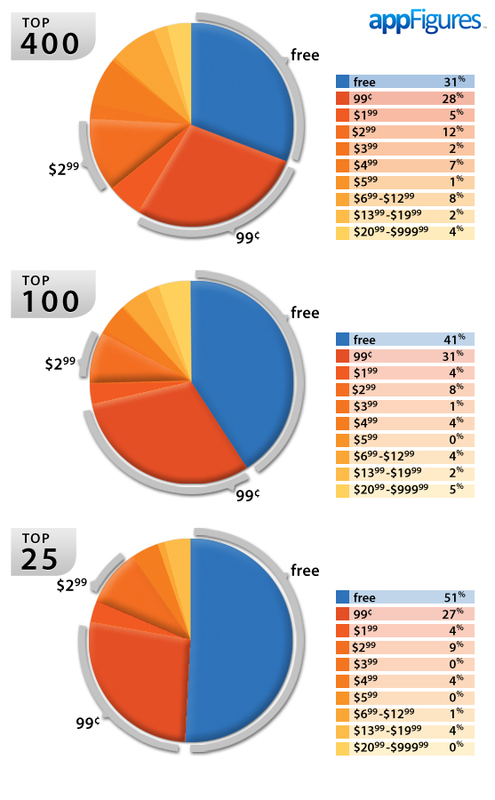 41% of top grossing apps are free, 59% are paid. This might come as a surprise to anyone using freemium games’ in-app purchases to finance the world’s largest virtual zoo or most tricked-out restaurant. But hold your horses (or lions or burgers) because free apps do start to surpass paid apps within the 25 top grossing—51% of these apps are free, 49% are paid. So among the highest grossing apps, the freemium model is making as much or more than the paid model. The freemium model appears to be a viable means of making revenue. Not only this, there are limitations to how profitable a paid app can be. Even if a paid app is extremely popular, the large majority of apps are dirt cheap. Most of the paid apps in all three of these tiers are priced at 99¢. The second most popular price is $2.99. In the top 25 grossing tier, 55% of the paid apps are 99¢ and 18% of them are priced at $2.99. We’re on the lookout for insightful App Store stats, so to keep up with the latest intel check our blog, follow us on twitter, or subscribe to our RSS feed.